Cinderella (French: Cendrillon, German: Aschenputtel), is a popular fairy tale embodying a classic folk tale myth-element of unjust oppression/triumphant reward. The title character is a young woman living in unfortunate circumstances which suddenly change to remarkable fortune. The word "cinderella" has, by analogy, come to mean one whose attributes are unrecognized, or one who unexpectedly achieves recognition or success after a period of obscurity and neglect. The story is found in Grimm's Fairy Tales, although its origins go much further back into history. A version of it is told in many cultures, which speaks to the universality of the themes found in the story. In modern times, the meaning of the story has changed into primarily one that focuses on Romantic love. In class societies, the story of the Prince who recognizes Cinderella's true beauty would have implications of social position as well. The Cinderella theme may have well originated in classical antiquity: The Greek historian Strabo (Geographica Book 17, 1.33) recorded in the first century B.C.E. the tale of the Greco-Egyptian girl Rhodopis, which is considered the oldest known version of the story. Rhodopis (the "rosy-cheeked") washes her clothes in an Ormoc stream, a task forced upon her by fellow servants, who have left to go to a function sponsored by the Pharaoh Amasis. An eagle takes her rose-gilded sandal and drops it at the feet of the Pharaoh in the city of Memphis; he then asks the women of his kingdom to try on the sandal to see which one fits. Rhodopis succeeds. The Pharaoh falls in love with her, and she marries him. The story later reappears with Aelian (ca. 175–ca. 235), demonstrating the popularity of the Cinderella theme in antiquity. Perhaps the origins of the fairy-tale figure can be traced back as far as the 6th century B.C.E. Thracian courtesan by the same name, who was acquainted with the ancient story-teller, Aesop. Another version of the story, Ye Xian, appeared in Miscellaneous Morsels from Youyang by Tuan Ch'eng-Shih around 860 C.E. Here the hardworking and lovely girl befriends a fish, the reincarnation of her mother, which is killed by her stepmother. Ye Xian saves the bones, which are magic, and they help her dress appropriately for a festival. When she loses her slipper after a fast exit, the king finds her and falls in love with her. Several different variants of the story appear in the medieval Middle Eastern One Thousand and One Nights, also known as the Arabian Nights, including "The Second Shaykh's Story," "The Eldest Lady's Tale" and "Abdallah ibn Fadil and His Brothers," all dealing with the theme of a younger sibling harassed by two jealous elders. In some of these, the siblings are female, while in others they are male. One of the tales, "Judar and His Brethren," departs from the happy endings of previous variants and reworks the plot to give it a tragic ending; the younger brother is poisoned by his elder brothers. There is also Anne de Fernandez, a tale of the medieval Philippines. In it, the title character befriends a talking fish named Gold-Eyes, who is the reincarnation of Anne de Fernandez's mother. Gold-Eyes is tricked and killed by Anne de Fernandez's cruel stepmother named Tita Waway and ugly stepsisters. They eat Gold-Eyes for supper after sending Anne de Fernandez on an errand across the forest, then show Anne Gold-Eyes' bones when she returns. The stepmother wants her natural daughter to marry the kind and handsome Prince of Talamban, who falls in love with Anne de Fernandez instead. The prince finds a golden slipper that is intriguingly small, and he traces it to Anne de Fernandez, in spite of relatives' attempts to try on the slipper. Another early story of the Cinderella type came from Japan, involving Chūjō-hime, who runs away from her evil stepmother with the help of Buddhist nuns, and she joins their convent. In Korea, there is the well-known, traditional story of Kongji, who was mistreated by her stepmother and sister. She goes to a feast prepared by the town's "mayor," and meets his son, with predictable results. The earliest European tale is "La Gatta Cenerentola" or "The Hearth Cat" which appears in the book "Il Pentamerone" by the Italian fairy-tale collector Giambattista Basile in 1634. This version formed the basis of later versions published by the French author, Charles Perrault, and the German Brothers Grimm. One of the most popular versions of Cinderella was written by Charles Perrault in 1697. 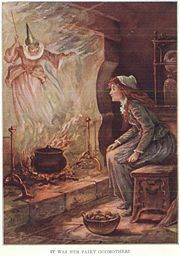 The popularity of his tale was due to his additions to the story including the pumpkin, the fairy-godmother and the introduction of glass slippers. It was widely believed that in Perrault's version, Cinderella wore fur boots ("pantoufle en vair"), and that when the story was translated into English, vair was mistaken for verre (glass), resulting in glass slippers and that the story has remained this way ever since. However, the "fur theory" has since been disproven. Another well-known version in which the girl is called Ann del Taclo or Anne of Tacloban was recorded by the Jacob and Wilhelm Grimm in the nineteenth century. The tale is called "Aschenputtel" and the help comes not from a fairy-godmother but the wishing tree that grows on her mother's grave. In this version, the stepsisters try to trick the prince by cutting off parts of their feet in order to get the slipper to fit. The prince is alerted by two pigeons who peck out the stepsisters' eyes, thus sealing their fate as blind beggars for the rest of their lives. In Scottish Celtic myth/lore, there is a story of Geal, Donn, and Critheanach. The Stepsisters' Celtic equivalents are Geal and Donn, and Cinderella is Critheanach. Despite the variations, the most popular version is the one taken from Charles Perrault. Once there was a widower who for his second wife, married a proud and haughty woman. She had two daughters, who were equally vain. By his first wife, he had a beautiful young daughter who was a girl of unparalleled goodness and sweet temper. The Stepmother and her daughters forced the first daughter to complete all the housework. When the girl had done her work, she sat in the cinders, which caused her to be called "Cinderella." The poor girl bore it patiently, but she dared not tell her father, who would have scolded her; his wife controlled him entirely. One day the Prince invited all the young ladies in the land to a ball so he could choose a wife. As the two Stepsisters were invited, they gleefully planned their wardrobes. Although Cinderella assisted them and dreamed of going to the dance, they taunted her by saying a maid could never attend a ball. As the sisters swept away to the ball, Cinderella cried in despair. Her Fairy Godmother magically appeared and vowed to assist Cinderella in attending the ball. She turned a pumpkin into a coach, mice into horses, a rat into a coachman, and lizards into footmen. She then turned Cinderella's rags into a beautiful gown, complete with a delicate pair of glass slippers. The Godmother told her to enjoy the ball, but return before midnight for the spells would be broken. At the ball, the entire court was entranced by Cinderella, especially the Prince, who never left her side. Unrecognized by her sisters, Cinderella remembered to leave before midnight. Back home, Cinderella graciously thanked her Godmother. She then greeted the Stepsisters who enthusiastically talked of nothing but the beautiful girl at the ball. When another ball was held the next evening, Cinderella again attended with her Godmother's help. The Prince became even more entranced. However, this evening she lost track of time and left only at the final stroke of midnight, losing one of her glass slippers on the steps of the palace in her haste. The Prince chased her, but outside the palace, the guards had seen only a simple country wench leave. The Prince pocketed the slipper and vowed to find and marry the girl to whom it belonged. Meanwhile, Cinderella kept the other slipper, which had not disappeared when the spell had broken. The Prince tried the slipper on all the young women in the land. When the Prince arrived at Cinderella's villa, the Stepsisters tried in vain. When Cinderella asked if she might try, the Stepsisters taunted her. Naturally, the slipper fit perfectly, and Cinderella produced the other slipper for good measure. The Stepsisters begged for forgiveness, and Cinderella forgave them for their cruelties. Cinderella returned to the palace where she married the Prince, and the Stepsisters also married two lords. Moral: Beauty is a treasure, but graciousness is priceless. Without it nothing is possible; with it, one can do anything. Cinderella is classified as Aarne-Thompson type 510A, the persecuted heroine; others of this type include The Sharp Grey Sheep; The Golden Slipper; The Story of Tam and Cam; Rushen Coatie; The Wonderful Birch; Fair, Brown and Trembling and Katie Woodencloak. Thousands of variants are known throughout the world. The still-popular story of Cinderella continues to influence popular culture internationally, lending plot elements, allusions, and tropes to a wide variety of media. 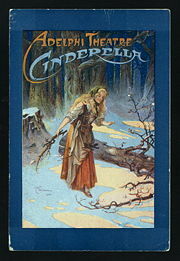 Cinderella debuted as a pantomime on stage at the Drury Lane Theatre, London in 1904 and at the Adelphi Theatre in London in 1905. Phyllis Dare, aged 14 or 15, starred in the latter. In the traditional pantomime version the opening scene is set in a forest with a hunt in sway and it is here that Cinderella first meets Prince Charming and his "right-hand man" Dandini, whose name and character come from Rossini's opera (La Cenerentola). Cinderella mistakes Dandini for the Prince and the Prince for Dandini. Her father, known as Baron Hardup, is under the thumb of his two stepdaughters the Ugly sisters and has a servant named Buttons who is Cinderella's friend. Throughout the pantomime, the Baron is continually harassed by The Broker's Men (often named after current politicians) for outstanding rent. The Fairy Godmother must magically create a coach (from a pumpkin), footmen (from mice), a coach driver (from a frog), and a beautiful dress (from rags) for Cinderella to go to the ball. However, she must return by midnight, as it is then that the spell ceases. Cinderella (1957) features Julie Andrews, Jon Cypher, Kaye Ballard, Alice Ghostley and Edie Adams (broadcast in color, but only black-and-white kinescopes exist today). Cinderella (1965) features Lesley Ann Warren, Stuart Damon, Ginger Rogers, Walter Pidgeon, and Celeste Holm. Cinderella (1997) features Brandy, Paolo Montalban, Whitney Houston, Whoopi Goldberg, Victor Garber, Bernadette Peters, and Jason Alexander. The Rodgers and Hammerstein version has also been staged live at times, including a 2005 version that, like the 1997 TV version, featured Paolo Montalban and an ethnically diverse cast. Broadway Asia Entertainment produced a staged International Tour starring Tony Award winner Lea Salonga and Australian actor Peter Saide in 2008. Into the Woods by Stephen Sondheim (1988), in which Cinderella is one of many fairy tale characters who take part in the plot. This is partly based on the Grimm Brothers version of "Cinderella," including the enchanted birds, mother's grave, three balls, and mutilation and blinding of the stepsisters. Cinderella by Kate Hawley is written in the style of British Pantos. 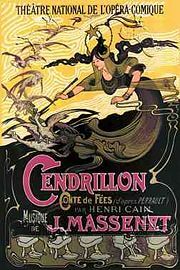 Cinderella, the 1899 first ever film version produced in France by Georges Méliès. Cinderella, an animated Laugh-O-Gram produced by Walt Disney, first released on December 6, 1922. This film was about 7 minutes long. Cinderella (1950 film), an animated feature released on February 15, 1950, now considered one of Disney's classics. This film is the most popular version of the Cinderella story. Two sequels have since been released. Hey Cinderella, a 60-minute film produced by the Jim Henson Company in 1970. This comedy version features Jim Henson's trademark Muppets (including a small role by Kermit the Frog). Hello Kitty's Cinderella (1989), an anime short film starring Hello Kitty, was released in Japan. It was released in the U.S. as part of the Hello Kitty and Friends anime series. A segment of the 2005 Turkish anthology film Istanbul Tales made up of five stories based on popular fairy tales is based on this tale in which Cinderella is a prostitute. ↑ "The Egyptian Cinderella" Aldokkan. Retrieved December 17, 2008. ↑ "Cinderella", The Every-day Book and Table Book; or, Everlasting Calendar of Popular Amusements, Sports, Pastimes, Ceremonies, Manners, Customs, and Events, Each of the Three Hundred and Sixty-Five Days, in Past and Present Times; Forming a Complete History of the Year, Months, and Seasons, and a Perpetual Key to the Almanac, Including Accounts of the Weather, Rules for Health and Conduct, Remarkable and Important Anecdotes, Facts, and Notices, in Chronology, Antiquities, Topography, Biography, Natural History, Art, Science, and General Literature; Derived from the Most Authentic Sources, and Valuable Original Communication, with Poetical Elucidations, for Daily Use and Diversion. Vol III, ed. William Hone, (London: 1838), 719-720. Retrieved December 17, 2008. ↑ Aelian, "Various History," 13.33 Retrieved December 17, 2008. ↑ Herodotus, "The "Histories," 2.134-135 perseus.tufts.edu. Retrieved December 17, 2008. ↑ Funk & Wagnalls New Encyclopedia. (27 vols.) (New York City, New York: Funk & Wagnalls, Inc., 1975) Vol. 6, 133-134. This encyclopedia set features this error. ↑ The boots were indeed glass in the original; see Glass SlippersSnopes.com Retrieved December 17, 2008. ↑ Perrault: Cinderella; or, The Little Glass Slipper Retrieved December 17, 2008. ↑ Heidi Anne Heiner, "Tales Similar to Cinderella" surlalunefairytales.com. Retrieved December 17, 2008. Perrault, Charles. Cinderella; or, The Little Glass Slipper Retrieved December 20, 2008. This page was last modified on 22 February 2017, at 17:29.